In this week's Sales Training newsletter we look at Tips on Overcoming Objections to Price. Price, price, price, it’s an objection that pops up regular and if you like me have competitors selling at prices below costs you know what a challenge it can be. The customer thinks they should haggle for a lower price. They have had a quote that is cheaper. They’re comparing your price to one from an earlier time when costs were cheaper. You’ve not sold the benefits and shown the value of your offer. And many more reasons, some of which make sense and many that appear to us as illogical. While some don’t make sense to us they are real in the customer’s world and have to be overcome if we are to close the sale. The important first step is not to get defensive. Stay calm and accept the sales objection as part of the sales process. It's just another step towards closing the sale. Think of the objection to price as a concern the buyer has that if you handle you will gain their agreement to the next step. For a quick way to overcome objections you might find the Feel Felt Found objection technique is just right for your sales pitch. Not appropriate for the big, formal sales meeting, but great for a conversational sales pitch. If you use a relaxed sales pitch, with an informal style of selling, this may be a great tip for overcoming sales objections to price. This is the objection process that I use with my working sales teams. It can be adapted for any product and any sales market. It has been successful in retail sales, direct sales, B2B and Field sales in many different markets. Take a look at an effective Sales Objection Process and see how you can adapt this process for you or your sales team. When a customer raises an objection that you are used to answering, or that you have an answer for, it is hard to stop yourself from diving straight in with a response. A really good tip for overcoming objections to price is to hold back, don’t respond, instead question the customer and make sure you understand the objection from the customer’s viewpoint before answering. The price is too high compared to what? A price the customer thought it would cost. The price they paid when they bought one twenty years ago. The cost of a cheaper, inferior version that will last half the time. Or, are they saying this purely because they think they should haggle the price. This is a really effective technique that comes from the discipline of NLP. (Neuro Linguistic Progamming) It looks at where the sales objection lies on the customer's map of reality. Yes, I know, sounds like weird stuff, but believe me this works. If you haven't used NLP before in your sales you might want to view this page first. Open NLP objection skills and get some new ideas. The page on defining the objection with NLP looks at what beliefs and evidence the buyer is basing their sales objection on. Then by demolishing the foundations of beliefs and false evidence their objection falls apart and you close the sale. Open Overcoming sales objections with NLP sales techniques and take a new viewpoint with this fascinating skill. The pages above are great places to start increasing your objection handling skills. After all, sales objections are usually the one thing that stands in your way when trying to close a sale. Learn to overcome sales objections to price and you have a money earning skill that will keep repaying you throughout your career. You can learn additional objection handling skills, and make them specific for your sales market, by using the sales training course below. It uses the objection skills and techniques from the pages above and condenses them into a sales training course in a workbook. You get an effective workbook course you can download and use today. This workbook training course shows you how to handle objections that are stopping you making sales, including overcoming objections to price. The sales training text and exercises make it easy to understand where the real objection lies, how to overcome it, and how to close the sale. There's a full money back guarantee. Secure payment using credit or debit cards or your Pay Pal account all via the secure Pay Pal site. Help and questions answered by using the contact forms on this site. Proven by working sales people just like you. 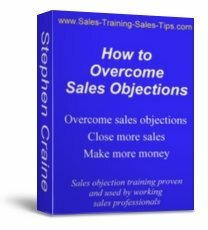 If you need more information before buying the sales objection training course click the image or open How to Handle Sales Objections.